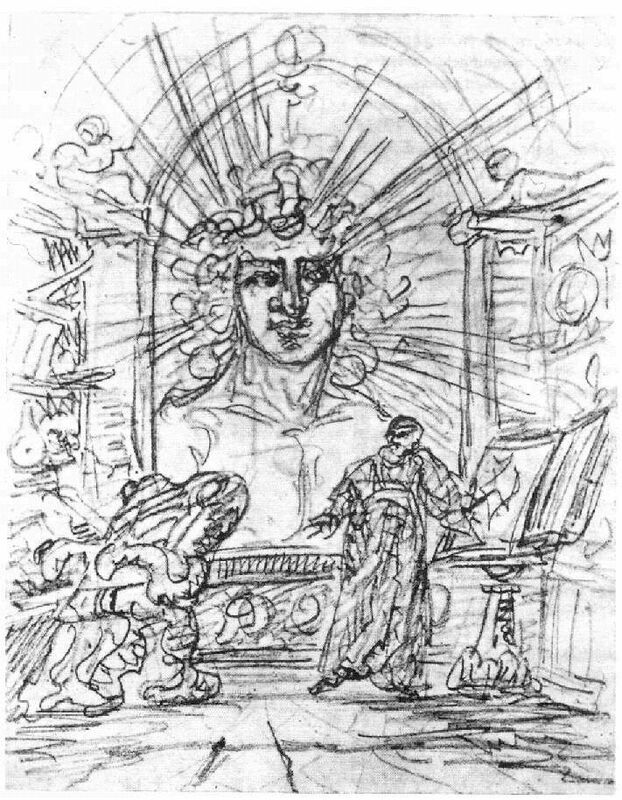 Posted on March 9, 2013 by Paul N.
This illustration by Goethe himself shows the earthly or earth-bound spirit who declares in his Faust tragedy part 1 “Thou’rt like the spirit thou canst comprehend, not me.” and vanishes. Goethe was not only a gifted play-writer and poet but also a naturalist. His scientific work includes the theory of colors. Characteristic of his life and probably his epoch in general is amalgamation of scientific and artistic endeavor. That is nothing unusual, rather comes naturally as both arise from the same spirit and creativity. Not surprising then that his Faust is not only a stage play about an antsy scientists but also lays the philosophical foundation of evolutionary theory, social evolutionary theory in particular. The phrase quoted above for instance found its repercussion in Marx’ famous thesis “Existence determines consciousness”. I remembered these phrases when noticing the recent flare of discussions about peer review in scientific publications (Robertson 2013) which states only consequences drawn from discussions several years before (Ploegh 2011), (Rosenbaum 2008). The measures now taken to improve fairness in peer review don’t touch the core of the problem, which is the reviewer’s subjective understanding. The improvements now implemented merely reduce sheer fraud. If for instance researcher A wants to publish a new idea, but researcher B, the reviewer in this case, is a strong competitor and wants to publish first; then researcher B may delay publication by putting big hurdles in the way. The hurdles might even become so difficult that publication becomes impossible at all. I didn’t believe that this is even possible, but obviously it is. It even has a long tradition. It looks like the Darwin Conspiracy (Davies 2008). We even may go so far to claim that peer review is the product of a social evolution process from Darwin’s more unique conspiracy to a systematic suppression of outstanding research. In a social context even crime may evolve. Now the new opt-out policy introduced by BMC Biology offers some relieve as researcher A is allowed to immediately try to publish elsewhere. Couldn’t believe that this was forbidden before, but it was. In fact, according to the peer review policy maintained by many prestigious journals, it is not allowed to try publishing elsewhere as long as the paper is in the review process. This is outright monopolizing science. This is equivalent to buying a patent to prevent its application. I can’t believe that enlightened and devoted to scientific progress scientists ever accepted that. The only explanation I can find for the fact that such a policy holds sway over almost all scientific publishing is that the bulk of scientists is mediocre and mean. Though opt-out policy is a tiny little step to reduce reviewer’s fraud, by far it would not eliminate it completely as everyone can imagine if journal A declines a paper because of reviewer A, the same can happen with journal B and reviewer B. Maybe B is a good friend of A or even the same person. But even if A and B are competitors themselves they share a common interest in fighting a new competitive paper that challenges their both reputation. Moreover taking aside this obvious fraud which might be effectively controlled sometimes as society becomes increasingly aware of it, there is an even greater problem behind. The subconscious aversion of all research that challenges the social environment. Everybody, and every scientist in particular, is caged in a social fauceir that controls almost all thinking. For instance, an academically employed scientists would never accept a social evolutionary concept that declares academic research out-of-date and disposable. But that is what really is at stage. Unfortunately I did not find an authorized translation, so I give my own rather free translation. “A swamp is spreading into the mountains, contaminating all human achievements. Draining that swamp is an heroic task of first and foremost importance. Davies, Roy. 2008. The Darwin Conspiracy – Origins of a Scientific Crime. First. Golden Square Books. Ploegh, Hidde. 2011. „End the Wasteful Tyranny of Reviewer Experiments“. Nature News 472 (7344) (April 27): 391–391. doi:10.1038/472391a. Robertson, Miranda. 2013. „Q&A: Re-review Opt-out and Painless Publishing“. BMC Biology 11 (1) (Februar 28): 18. doi:10.1186/1741-7007-11-18. Rosenbaum, Joel L. 2008. „High-Profile Journals Not Worth the Trouble“. Science 321 (5892) (August 22): 1039–1039. doi:10.1126/science.321.5892.1039b.